There have been comprehensive studies and planning documents in the past three decades regarding the wetland enhancement in the Meadowlands. 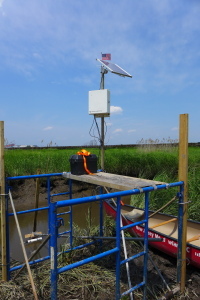 These documents indicate the need to measure the physical and ecological impairments to ecological function and to perform plant biodiversity assessments as a first step towards wetland enhancement. Seven tidal wetland sites totaling one hundred and five hectares (105 Ha) were selected to measure ecological function and impairments, including the nature and extent of invasive species, lack of plant diversity, lack of tidal exchange, and habitat fragmentation. Create a plan for better wetland enhancement and restoration by identifying quantifiable restoration metrics and gathering strategic data to select sites appropriate for acquisition and wetland enhancement and restoration. We propose to use a combination of traditional field monitoring techniques along with remote sensing methods and modeling to characterize species diversity, habitat fragmentation, and hydrological restrictions as a way to measure impairments to wetland function. The project is funded by EPA Grant No. CD-96294800.